Tabula Rasa. You know I had to google it. It means that all knowledge comes from experience and that we weren't born with it. Interesting concept, but as a former biology student, I'm not sure I agree with it; well, you'd have to define what kind of knowledge you are speaking of. Arcona's Tabula Rasa, sparks the same sort of curiosity in me. I have been sitting on this review for some time because of that, but it's time to let the cat out of the bag. Before I get into the specifics of the review, I have a sneaking suspicion that this product has a serious case of YMMV. The ingredients are a double-edged sword and how much you enjoy this product will depend on how you feel about the ingredients and obviously, if it does anything for your skin. Oily, acne scars on chin and cheeks along with the monthly hormonal acne that causes said scarring. I use pretty harsh acids (at least 10% lactic acid, glycolic acid, and sometimes alpha lipoic acid) most days of the week to help with that. From the brand: Spot specific blemish fighting formula helps combat breakouts, reduce enlarged pores, soothes ingrown hairs and razor burns. Exfoliate, unclog pores, combat skin eruptions and kill bacteria with lactic acid. Stimulate cell renewal with allantoin and grape seed extract. Cleanse and increase circulation with naturally antiseptic witch hazel. I used it as a spot treatment on my face to prevent and fight my hormonal acne. Three pumps on a thin cotton pad were enough for all the spots I needed to use it on. I did not test this for ingrown hairs or razor burn. Because my breakouts are monthly, hormonal, and infrequent I did not use this every day. I only used it when I needed it; when I saw signs in my skin. The directions on the bottle say to use daily, as needed. I took that to mean as needed. The directions also go on to say that the benefits of usage are cumulative with regular use. Because I did not use this product regularly, I did not experience these cumulative benefits. As an experiment, I left this on my face overnight on a very thin cotton pad (the Muji ones) and woke up with a burn on my face; yeah worse than the dark spots I was trying to get rid of. This was in concert with alpha lipoic acid and others, but mostly due to this, since I always leave the other products on overnight and wake up unscathed. I was disappointed (in myself mostly for continuing to experiment on my skin without researching the consequences) but that subsided after three days, after the burn had peeled off and my hyperpigmentation was significantly lightened. I certainly wouldn't do that again, even though the results were surprising, and I certainly don't suggest anyone try that at home; the discomfort wasn't worth it, in the end. I used this until it was all gone. It took me about half a year to use it all up. 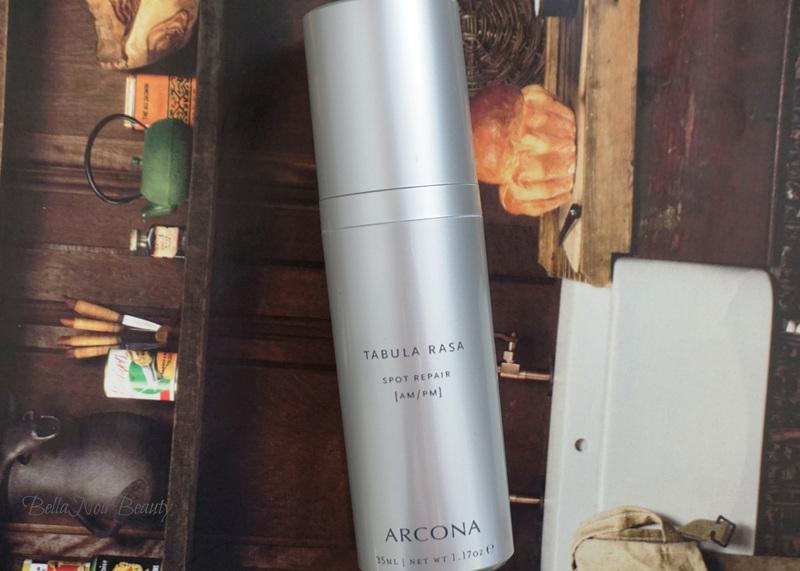 Tabula Rasa was very gentle on my skin, when I used it correctly. It was nice for me when I wanted a break from all the acids I normally use. I can also appreciate the short ingredients list, which is almost all natural, if that's what you're into. I really like the brand's identity; it's got a great no-nonsense ingredients-based vibe about it, coupled with clean and sophisticated packaging. It really forces me to step back and take a look at my skin, and stop treating it so roughly all the time (check out my review of their tea tree mask). I'm looking forward to discovering more from the brand. Tabula Rasa has a lot of alcohol in it. I imagine many people would not appreciate this. I have oily skin, so I can do with alcohol on my skin and I don't mind it as much as others might. If I were suggesting improvements, I would say lose some of the alcohol - there's more of it than water - and add more lactic and salicylic acid; there's only two percent of each in the solution. For salicylic acid, this is a normal concentration but this is acetylsalicylic acid, which I was not familiar with. As it turns out, acetylsalicylic acid is aspirin. I'm not personally familiar with aspirin in skincare, but I have heard of people using aspirin in masks. I didn't notice it reducing the size of my zits used as a spot treatment, but from the burn I got from this, I'd definitely say it had the ability to improve the texture of the skin and improve hyperpigmentation with consistent use.